I will elaborate more about the information content of data tables in an upcoming article. Let’s continue with the table notation. 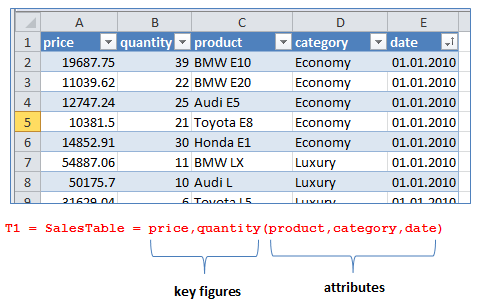 .. where the function f might be a 1-N hierarchical relationship between product and category. ExamplesInExcel Zipped Excel file (+ pdf manual) with test tables for running some table operation examples like filtering, inserting related fields and aggregation mentioned in this article. ExcelInstructionsPDF A short and visual manual (pdf file) with instructions for running table operation examples in Excel. VisualStudioProject Zipped Visual Studio project for running table operation examples (filtering, inserting related fields, aggregation) in C#/.NET environment. Following examples show the notation for subtables that contain a selected set of rows of the original table. Note that recurring rows (i.e. recurring attribute-value-combinations) must be unified in a table union operation. Metadata means information about the fields of data tables. Metadata contains information about the individual fields (i.e. key figures and attributes) and their relationships. As an example, a key figure relationship like sales = price x quantity belongs to metadata. What this equation means: Sales numbers can be aggregated over products to obtain sales per category, because there is a hierarchical 1-N relationship between product and category. A table operation is valid only if the information content of the resultant output table is correct. Sounds complicated isn’t it? But it is in fact simpler than it sounds. Let me explain it with simple examples. Excluding the column date (column partitioning) is in this case an invalid operation because the data in the resultant table is not correct; prices are not constant as this table wrongly implies, they vary with date. Similarly, we can’t aggregate prices over dates to obtain the prices per product, price(product). This would also be an invalid operation. An aggregation is valid only if such a relationship is defined (or permitted) in metadata. In many cases, metadata will tell us if a table operation is valid or nor. For example, excluding an attribute from a table will be valid only if it is a function of other attribute(s). An operation like ..
.. will be valid if category = f(product), where the function f could be a hierarchical relationship. After this introduction about notations and valid operations we are now ready to make a definition for the concept Information Content of Data Tables as a preliminary for the upcoming article. Information Content (IC) of the tables (Ta1, Ta2, .. TaN) contains Information Content of the tables (Tb1, Tb2, .. TbM) if (and only if) all the tables in the second set (Tb1, Tb2, .. TbM) can be derived by applying some valid table operations on the first set (Ta1, Ta2, .. TaN). While some table operations are always valid (like key figure separation/combination as shown above) metadata (information about fields and their relationships) will generally tell us which table operations are valid. This entry was posted in Calculation engine and tagged table functions, table math, table notation. Bookmark the permalink.